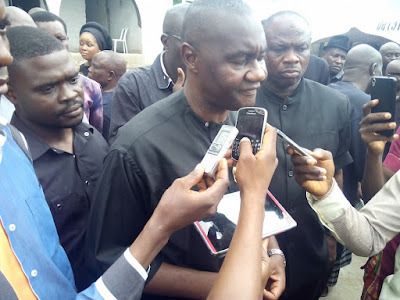 Senatorial Candidate of the All Progressive Congress for the July 30th Rescheduled Rivers South East Senatorial District Senator Magnus Abe has said that the burning of the Khana Office of the Independent National Electoral Commission for yet to be identified arsonists was a ploy of the PDP to use the Khana Local Government Area Secretariat as a Collation center . Mr Abe stated this why speaking during inspection of the scene during the weekend. “What is shocking about the destruction of this office is that this is where you will regard as the Green Zone as far as Bori is concerned. On your left, you have the offices of the local government. On your right you have the residence of the Chief Security Officer of the local government. Right behind you here you have where security officers stay, and people could come right into the heart of this place to carry out this kind of dastardly act. “And I hear that already some people are on air offering the council as an alternative. If we can protect the council, why can’t we protect the office of our own umpire in an election we are all going to contest? “You know, I really think that the key to this problem, the solution to this problem is proper law enforcement. You can see that what happened to my office is the same thing that happened here. The same kind of dynamite, the same kind of attack is exactly the same kind of thing we are seeing here. “I want to call on the Inspector-General of Police, I want to call on all the law enforcement agencies, let’s not treat this as another issue to be swept under the carpet. Let the I.G.P look for policemen whose integrity cannot be called to question. It’s not the ones nominated by any interested party. The ones that will do the work of the Nigeria Police, let them come and get to the bottom of this incident. Let us unmask those who are behind some of these things. “Until we leave chasing the small boys and go to the godfathers who are the sponsors, who are paying for these things, who are buying the guns and bullets and bring them to book, I don’t think we will see an end to this kind of behaviour.” He Stated.